This session plan works on perfecting catching throws that are not directly aimed at the players chest. This is a vital skill for players to learn so that they are able to adapt to any throw when translating this into a game-like environment. 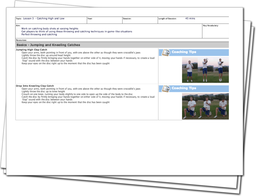 This in-depth session plan provides a breakdown of the kneeling and jumping catching techniques that will give the players the knowledge on how to adapt to off-target throws. By the end of the session the players should have further improved their throwing and catching techniques and be able to adapt to throws that are thrown slightly off target.